Ans sheet is (4). Can anyone help to explain how? The mixture of ice & salt has a freezing point below 0 deg C (info given in the 1st statement). A – Not true. The thick styrofoam is a bad conductor of heat. The syrup will not lose too much heat to the ice/salt mixture and therefore will not freeze. 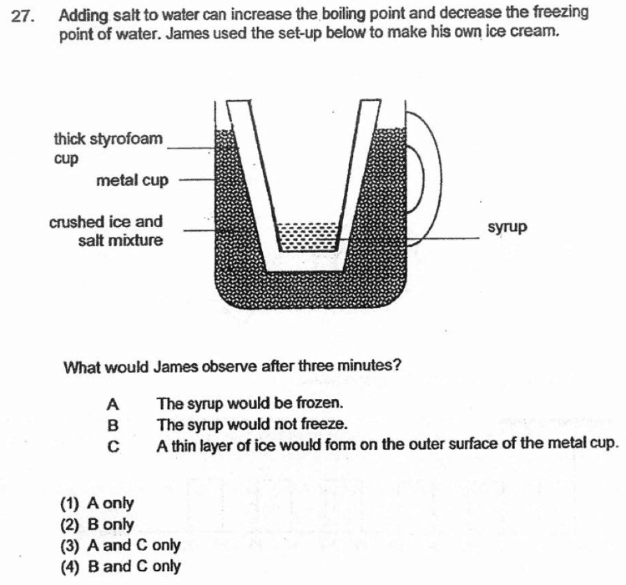 C – True The metal cup is a good conductor of heat and it loses heat to the ice-salt mixture and also becomes cold. The water vapour in the air around the metal cup will lose heat to the cold metal cup and condenses onto the cup, and then freezes, since the temperature of the ice-salt mixture (and the cup) can go below 0 deg C.